Been sort of wowed by the rainfall lately. It's near muck boot weather here. Other places are seeing their 100 year events and it just keeps getting crazier. Tuesday, just south of Denver, CO, a 32year old woman went to go check on her best friend's cat, as her friend was vacationing to see family. While she is there in the basement apartment a very heavy rain fell, 2 1/2 inches in 30 minutes. The basement flooded quickly. She and the cat drown. There was a guy and his son nearby in a similar basement apartment. They said the water rose to chest deep in seconds. They barely made it out alive. They had several birds drown though and are traumatized. The river at Hersey and nearby is still high but has come down some, emergency officials are expecting more rise and say don't be complacent.. There is at least one woman missing there that had tried to cross the flooded Conewago Creek near Elizabethtown. There has been 7-11 inches that has fallen in the area over the last five days. The City Island parking garage, Hersheypark and Knoebels Amusement Park in Elysburg were closed again today due to flooding. National Guard is rescuing people. There has been chemicals and oil released in this. It's recommended to stay out of these floodwaters. It's one disaster after another currently with stuck ridges drying out certain areas and drowning others. In the United States there has been tornadoes, wind, lightning and hail damage. Watch out for the run off. Dunkirk had over 2 inches of rain over the weekend which helped overload the sewage system leading to a dump of 900,000gallons of partially treated sewage into Lake Erie from Wright Park Drive. Laos had a horrific hydroelectric dam fail leaving hundreds missing or dead, with many more stranded and homeless. Japan continues to clean up from their epic floods while dealing with a historic heat wave. The heat related death toll this past week was 65 with 22,000 heat related hospital stays. Ongoing heat waves are also occurring in the United Kingdom, South Korea and Algeria. Greece Wildfires are claiming lives at an alarming rate. The death toll is 74 and climbing. This area wasn't all that dry until recently either. Last night really hot dry air blew through on gusting winds creating this fire storm. Published on Jul 24, 2018At least 50 people have died in Greece's worst forest fires in a decade. These dramatic pictures show the devastation near Athens. Tampa Bay had a storm yesterday that took more than 5,000 houses off the power grid. It also flooded streets and knocked down trees. 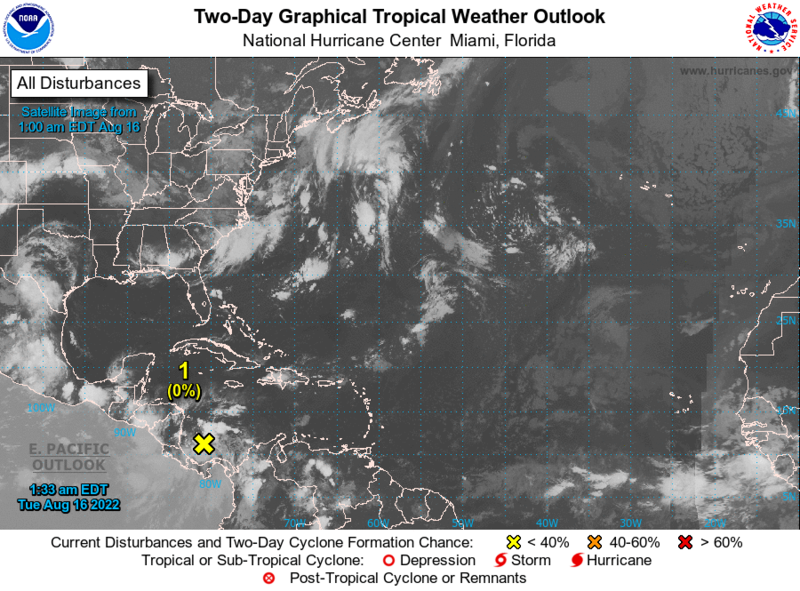 Tropics look quiet for now. This weekend's area to watch may be overland as a low comes over South Dakota & Iowa to strengthen over the Great Lakes before dipping Southeast and weakening. Along the way it may cause some severe weather and heavy rains to it's east and southeast sides. Models have been back and forth about a brief weak tropical or subtropical storm forming near the coast. Looks doubtful with all the land interaction and proximity of the parent low. Weather along the Northeast coast should get interesting either way. The pattern of a higher latitude placed high pressure in the Atlantic with winter pattern like storms coming across CONUS with this squeeze of heavy weather at times playing out from the Appalachians to the Northeast coast is likely to continue. May see things shift to overall wetter with more tropical weather near the end of the month when the MJO comes back to America. NASA's July forecast run is out. Posted below is the Sea Surface Temperature anomaly and Precipitation anomaly for July, August and September. No major changes from before. It has over time backed away from a fast evolving El Nino and now leans more neutral with cooler water up welling in the East Pacific. Overall the trend for a drier Caribbean and more home grown storms still looks likely for the first half of the Atlantic season. With Sea Surface Temperatures expected to be arranged as such more floods in India, Japan and China wouldn't be surprising. Lake Okeechobee water release resumed today. The lake levels are at their third highest for the last eleven years at 14.48ft. They plan to try the releases in pulses instead of a steady stream to more simulate rains. The lake is currently mostly covered with a blue-green algae. Not only are the locks opening to go out to the oceans, they are draining it south as well, into Everglades National Park. The new reservoir plan was passed by Trump. It goes to Congress next. Recent developments in Washington DC have also led to progress on multiple long-term projects that will give water managers more flexibility when making decisions in the future. American Meteorological Society put out an article on Weather Safety at Venues and Public Gatherings. Turns out people are killed every year by weather at these events. The ways varied. One of the worst was the Pope visiting in a heat wave. Others included lightning, large hail, stampede, down burst, stages being blown over and terrorizing wind vs tent incidents. Apparently many organizers don't have weather plans or hope for the best. There is a lot of helpful tips in there for event organizers to be weather ready and avoid weather injury & death litigation. For the attendees, it's best to stay aware and seek shelter as needed. Tropical Storm Beryl formed today. He's a tiny storm, currently with an 5 nautical mile diameter eye. It's small size is making it difficult to forecast. It is at 55kts and could become a hurricane before it's expected to fall apart in front of the islands. Refresh for latest or go here for loop. There is a second area of interest not far from the Southeast, in the Atlantic. It only has 40/50% chance at two and five days. Wouldn't be surprised to see another weak storm out of this. Also broke a daily lightning record for number of strikes. Watching some disturbed weather from the west as get into the Gulf of Mexico. It probably will not develop as it goes west bringing more rain to Houston, TX. It's more of an upper level feature as is the one off the South East. Looks like another repeat pattern with temperatures cranked coming up over the next two weeks with a wandering, flooding low in Missouri, Iowa, Illinois region & more weather moving off the Eastern Seaboard. The worst of the heat wave in the east will wander all week overheating a few states everyday. The west half of the country can mostly expect to cook at least the next two weeks. ENSO has been on a quick ride into warmer conditions as the warm pool of water has come to the surface in the 3, 4 region and farther east. ESPI has come up quick too, it's -0.11. El Nino condition occurring soon appear likely. There is enough heat we may see an official El Nino persist. This subject will most likely be revisited in a week when the July forecasts are out, but for now lets see what the forecast from June promised for July. NASA GMAO forecast has the likely areas for tropical development being in the Eastern and Western Pacific. The Gulf of Mexico and Caribbean look really dry and considering the trail of dust from Africa going on, no real surprise. South East and East Coast maybe in for a little extra rain. Expect heat complaints from the west half of the United States. Northern Hemisphere mostly above average to average with continued notable flooding in India. Looks like extra heat to Antarctica with larger than usual sea ice off shore. This is a newer band been watching since got into the Old Time scene. Had a lot of Fun jamming with them at Barberville in the spring. Saw them preform a few weeks ago. Liked this song when saw it live, wanted to share the video they put out of it the other day. Remedy Tree is an Americana/folk band from St Augustine FL. Their lyric driven energy filled songs fill their melodious harmonies with a renewed sense of drive as they intertwine roots Americana music, bluegrass, and old-time music. Gabriel Acevedo, a singer/songwiter, Florida State Fiddle champion and guitar player from Umatilla FL started writing songs at a young age and formed several bluegrass bands with his brother Obed Acevedo spanning from 2008-2014. Gabriel formed Remedy in the Summer of 2015 with his wife Abigail Acevedo. Their sound has grown as they've honed in on original content, drawing influences from contemporary and traditional artists alike such as Old Crow Medicine show, Mandolin Orange, and The Avett Brothers. Remedy Tree currently consists of Gabriel Acevedo(Fiddle, Guitar), Abigail Acevedo(Guitar, Bass), Aaron Morse(Mandolin) and Benny McDowell (Banjo). They currently tour locally and across state lines alike playing small venues, and festivals, promoting their latest EP release Juncture #1.